Benjamin Samuel Dunn Penny was born in January 1848 in West Coker, just a couple of miles west of Yeovil, the son of John Dunn Penny (1817-1856) of West Coker and Ann née Dunn (1812-1875) - as you might have gathered from the names, there was a very close connection between the Penny and Dunn families of West Coker. John Penny was the Innkeeper of the New Inn, West Coker, and was listed there in the 1851 census with Ann and their children; Elizabeth (b 1844), Mary (b 1845), Ann Elizabeth (b 1847), three-year old Benjamin and nine-month old John, together with two servants. John and Ann were to have two more daughters; Amelia (b1853) and Frances (b 1856) but John died in 1856. Ann remarried in 1858 to Edward Patten, a miller who became the new landlord of the New Inn and the 1861 census listed Edward and Ann at the inn with Ann's youngest five children. I've not traced Benjamin in the 1871 census, but it is most likely that by 1873 he was running a drapery at Alma House in High Street. Alma House, situated in High Street to the immediate east of the Mermaid Hotel, was, most likely, originally built in the late seventeenth or early eighteenth century as a private town house of two storeys and three bays. Certainly by the early part of the nineteenth century it had been converted into shop premises. A known early occupier of Alma House was draper Joseph Penny, born in West Coker in 1821 (Benjamin's uncle - the brother of his father, John). Joseph ran a draper's shop at Alma House from 1845 for eleven years before selling his business to Albert Edwards in May 1856. Albert Edwards ran his drapery business from Alma House for the next twenty years or so before moving his business into 8 High Street (today the premises of Clement White) in 1873. It is most likely that Benjamin, at this time aged 25, began his drapery business. In 1876 at the age of 28 he married Sarah Young (b 1854), originally from Hardington Mandeville, at St John's church, Yeovil. They were to have two children; Ada J (b 1878) and Ernest B (b 1885). By the time of the 1881 census Benjamin and Sarah were living at Alma House with Ada, six draper's assistants and two domestic servants. In the census Benjamin gave his occupation as 'Draper & Clothier employing 7 Assistants and 3 Boys'. 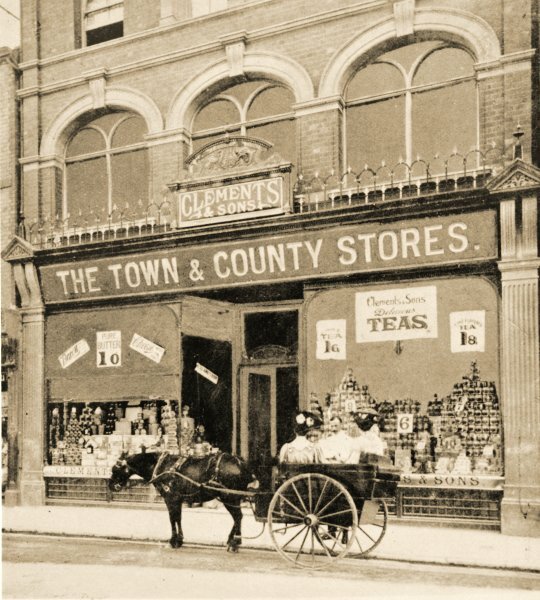 It would appear that Benjamin was doing extremely well in business and in 1882 opened the Town & County Supply Stores in High Street, opposite Alma House. From his advertisements (see below) it would seem that Penny used Alma House as a base for his funeral services as well as a drapery and clothing department, certainly from 1882. in 1888 Benjamin Penny was advertising his 'New Combination Funeral Carriage' for hire from Alma House (see below). By the time of the 1891 census Benjamin and his family were living at 9 Princes Street, (at this time a residential property, see photo below) together with his female employees; a milliner, two millinery saleswomen, a drapery saleswoman, four draper's assistants, a cook and a housemaid. Above the shop premises at Alma House lived his four male employees; an outfitter's assistant and three drapers & clothiers apprentices. In the summer of 1899 Sarah died at Yeovil aged 45 and in the following 1901 census Benjamin was listed at 9 Princes Street as a 52-year old widower with his widowed sister Frances, aged 45. Also living with them were the female staff; a cashier / bookkeeper, seven draper's assistants, a cook and two housemaids. Living above the Alma House premises were two male employees; an outfitter's assistant and a draper's assistant. Mr B Penny, the well known draper and outfitter, Alma House, High Street, has for a number of years been identified more especially with the mantle, millinery, and outfitting trade of the borough, and maybe said to take a lead in those branches of business which is based upon the theory that small profits bring quick returns. He exhibits a large and varied stock of materials both in household and personal drapery, while in mantles and millinery it would be difficult to find greater variety or a more substantial selection for meeting the requirements of customers. Ladies' hats, trimmings, feathers, ribbons, laces, etc., are shown in profusion, and both in style and finish they command approval. Shawls and wraps, hosiery, gloves, ties, etc., are also in evidence, but the feature of the establishment is its exceedingly fine display of mantles, at marvelously low prices. Great experience and sound judgment is shown in bringing together such a selection, and we imagine this accounts for the constant increase in the amount of business done by Mr Penny during the past few years. In the tailoring and outfitting branch the same taste and judgment is evident. The large stock of tweeds, Meltons, West of England cloths, serges, livery, and other cloths and suitings being of a superior quality, and all obtained from the best manufacturers. Only experienced workmen are employed under the constant supervision of one of the best cutters in the trade, scrupulous care is taken to ensure the satisfactory and immediate execution of all orders, and the garments turned out are of superior style, and can be guaranteed for fit and good workmanship. Special attention is given to the mourning department, the large staff of experienced employees enabling Mr Penny to promptly and satisfactorily perform all orders on the shortest notice. 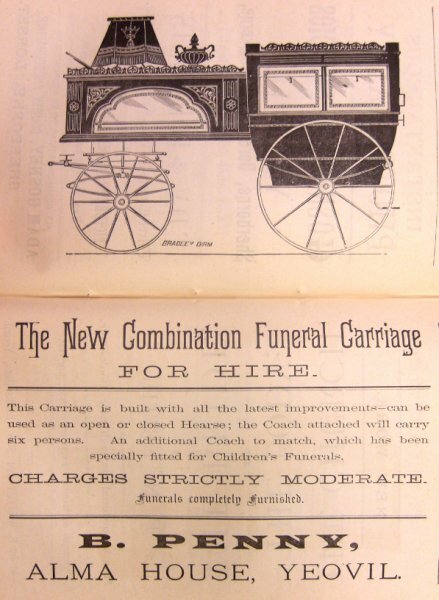 Hearses and mourning coaches are always open to engagements, and to suit the modern ideas, Mr Penny has introduced an exceedingly graceful and convenient 'combination' funeral carriage, which can be used as an open or closed hearse, with a carriage attached to hold six persons. The premises comprise two large and commodious shops in the 'Borough' next to the Mermaid Hotel, close to the Market House or Town Hall, the banks and all the principal business and social meeting places of the town. The proprietor buys for cash, and his system offers the public excellent value for their money. Benjamin remarried on 5 February 1902 to Yeovil-born Alice Jane Dawe (b 1863), fifteen years his junior, at Wimbledon, Surrey. Benjamin carried on business at Alma House until around 1908, when he retired and the business was taken over by tailor and outfitter John Gliddon. After his retirement Benjamin and Alice moved to Holcote House, Mudford Road, where they were listed in the 1911 census together with a cook and a general domestic servant. Alice died in the spring of 1915 at Yeovil aged 52 and Benjamin died in Yeovil on 19 March 1919 aged 71. His will was proved in June that year and his effects valued at £18,853 12s 10d (around £4.4 million at today's value). 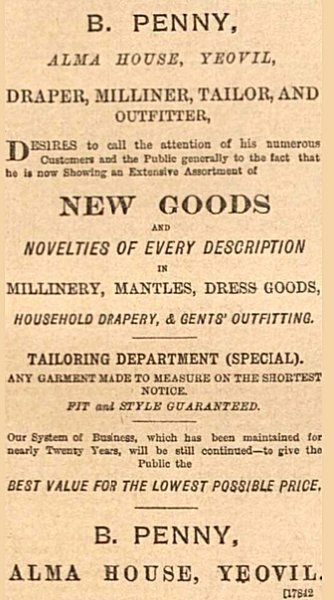 By the time this advertisement for the opening of the new Town & County Supply Stores in High Street (later the premises of Thomas Clements) was placed in the 14 July 1882 edition of the Western Gazette, Benjamin Penny was owner of both the new T&C stores as well as the drapery in Alma House on the opposite side of the road. 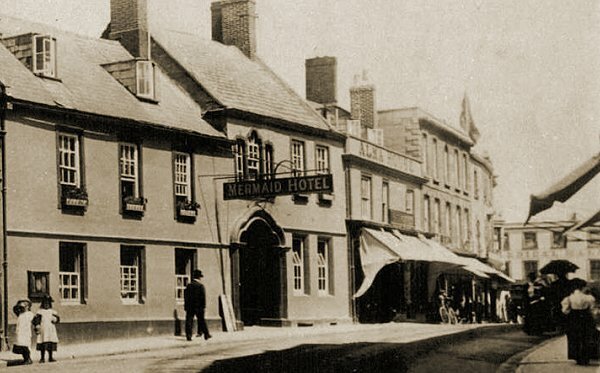 The Town & County Stores in High Street (opposite the Mermaid Hotel), photographed around 1910 at which time it was Clements & Sons. Benjamin Penny's advertisement in Whitby's Yeovil Almanack Advertiser of 1888. This advertisement in the 4 May 1894 edition of the Western Gazette is typical of many advertisements placed in newspapers by Benjamin. 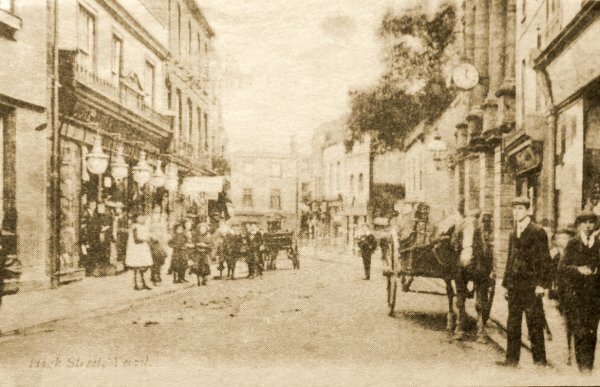 A postcard of High Street, dated 1905. 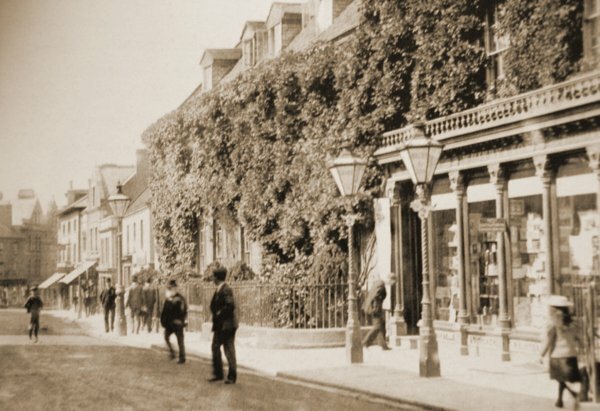 Alma House (at this time it was John Gliddon's shop) is at left with the five large lamps outside. On the opposite side of the road, the columned building is the Town Hall and at the very far right edge of the photograph is just glimpsed the Town & County Stores that had also been owned by Benjamin. An Edwardian postcard showing Alma House at centre, next to the Mermaid Hotel. 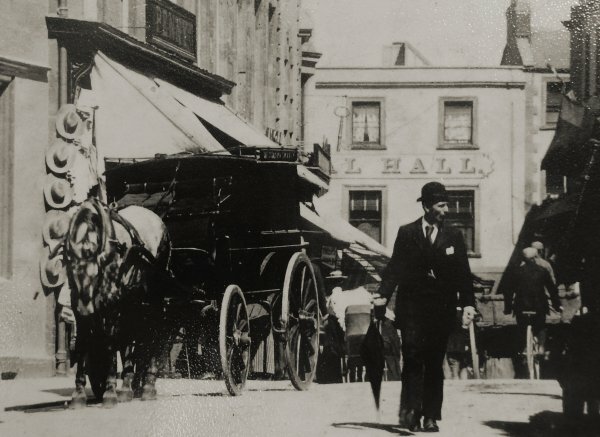 Photographed around 1912, a man (looking every part the city gent with his bowler hat and umbrella) walks along High Street past Benjamin Penny's draper's shop. In the 1891 census Benjamin and his family were living in the ivy-clad house at the centre of this photograph, next door to Ebenezer Whitby & Sons' bookshop, printers and stationers with a pair of single Sugg lamps outside. This photograph was taken about 1900. 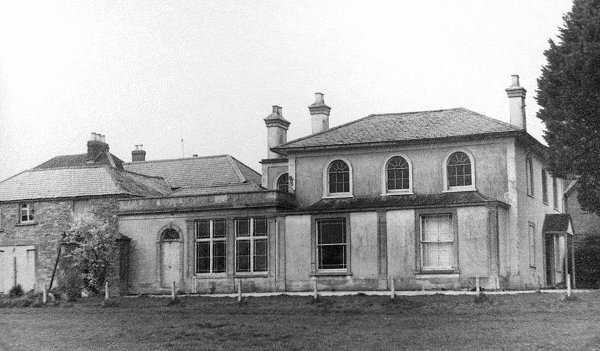 Holcote House photographed in 1972. This was Benjamin's home, probably from the time of his retirement in 1908 but certainly from the time of the 1911 census, and until the time of his death in 1919.